So we have arrived at the airport. Mum got stopped at security, they didn’t believe the suncream was a 100ml bottle; like mum would make that mistake! 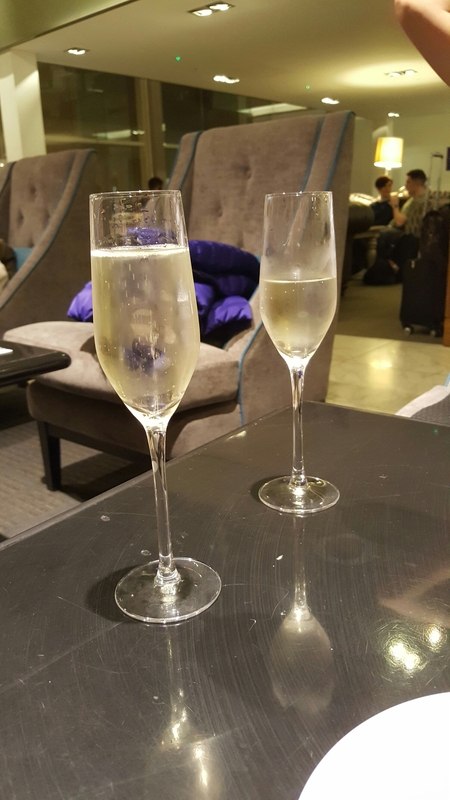 We also made a pit stop at the duty free for prosecco, figured it would be rude not to have a drink on mums birthday in the hotel. Mum also decided that we would not bother with the executive lounge…. until we got here. So we are now sitting very comfortably with a glass in hand. I must say this is definitely the way to travel! Shame Dubai will probably be my last taste of serious luxury for a while. Also loaded my case with chocolate, should make a seven hour flight with mum a little easier…. Author deardad20Posted on February 2, 2017 February 2, 2017 Categories PlanningLeave a comment on At the airport! So my early Christmas present was a phonecall letting me know my Vietnam trip had been cancelled. Wonderful! After hours of internet hunting there are no tours that fit with the dates and the flights I have booked, so I am going it alone. Mum is not overly happy, but agrees I don’t really have much choice. I just need to promise I stay in touch. I am also massively over budget, not sure how I am going to sort that one. I’ll figure something. The last few weeks have been manic, but we made it through Christmas without too much drama. It was weird you not being there though. We even made it through Boxing Day! Everyone was amazing in helping us prepare for it. We knew you worked you arse off Boxing Day morning, but this year gave us a new found appreciation of just how hard you worked. I also wished we had paid more attention to how you did it! Started sorting out what to pack too. Going to be a mission to stay within the weight limit! Let’s face it though, packing was never your thing. I am sure right now you would look at all the stuff laid out in my spare room and laugh. You would no doubt make a wise crack comment like “there is no way all that stuff will fit in that case” and then of course I would have to prove you wrong! 3 Weeks today and we will be off! Trying to organise Mum’s side of the family for two weeks has been harder work than organising my entire trip! We don’t seem to be getting very far very fast but I am sure they will sort themselves out eventually. They are going to have to as the cost of the flights keeps increasing. This bit of the trip would be your idea of hell. Lot of people, organisation, trips, hours of driving and Las Vegas. I am kind of writing these two weeks off as a detour from your bucket list. But the family will all be out there, we get to watch Esme graduate and I get to go on an epic road trip down the west coast of USA with my brother, so it’s all good. We went to the ball on the Pier the other day, you would have loved it! Kerry put on an incredible night. Safe to say your kids scrub up well when we want to. We also met up with the ‘Wetset’ for a meal at Cadbury. They were all impressed with the trip I have planned; well, impressed and slightly envious. Right, better go, there are four Christmas trees that Mum will need help putting up and decorating. This post has not really been much about travelling, but oh well! – It’s Christmas. Author deardad20Posted on December 4, 2016 December 4, 2016 Categories PlanningLeave a comment on Organising the Family…. Hey Dad. Can’t believe it has been so long since I updated this blog. Life has been a little hectic. In all the chaos however I have finally settled on a date to go. We leave for Dubai on the second of February. A few more things are also falling into place. I stumbled across the perfect bag for me to travel with. It is a backpack with wheels, that should spare my hips! Grandad is very impressed. Just as well as he and nan want to buy it for me for Christmas. I even have mum in training. She is walking the hills around Worlebury most days to get a little fitter for China. The neighbours are finding her training wardrobe hysterical mind. She has acquired your old base layers and trackie bottoms, an old beanie hat and some ear muffs. She does look a sight, but who cares! We will be in Dubai for mums birthday too. Three guesses where we have booked in for dinner that night! I have so much more to tell you, but that will have to do for now. I am going to be late for work! Author deardad20Posted on November 28, 2016 December 4, 2016 Categories PlanningLeave a comment on It Is BOOKED! Hey Dad, So I think I have finally worked out a rough route! I get to visit a huge chunk of your bucket list, and fulfil a few dreams of mine along side. Some things you wanted to do I have put on hold as the countries are not safe at the moment. I am going to start in Dubai, then onto China, Vietnam, Cambodia, Australia, New Zealand, Fiji, Hawaii, USA and finally fly home. One incredible thing is we have all been invited to Ez’s graduation in Fresno! Unbelievably, graduation day is the same day as your birthday. You couldn’t really make it up. The whole family think it is quite amazing the swimmer of the family will graduate on your birthday. My plan is to time this trip to meet everyone out there and then all head to Vegas for a few days. Planning it all however is getting very complicated and confusing! Even mum has given up listening to me. Now to get a proper plan in place! I finally got around to setting up this blog. I have been meaning to do it for weeks, but I had no idea where to start. The biggest challenge I have come across so far……. convincing Mum this is a good idea. You can imagine how the conversation went. I did make sure there were a few glasses of wine inside her before approaching the subject, after all; I am not stupid! It has taken a few weeks of convincing, constantly droning on about it, but I think I may have finally won her over! Now to start planning! – I will keep you posted.